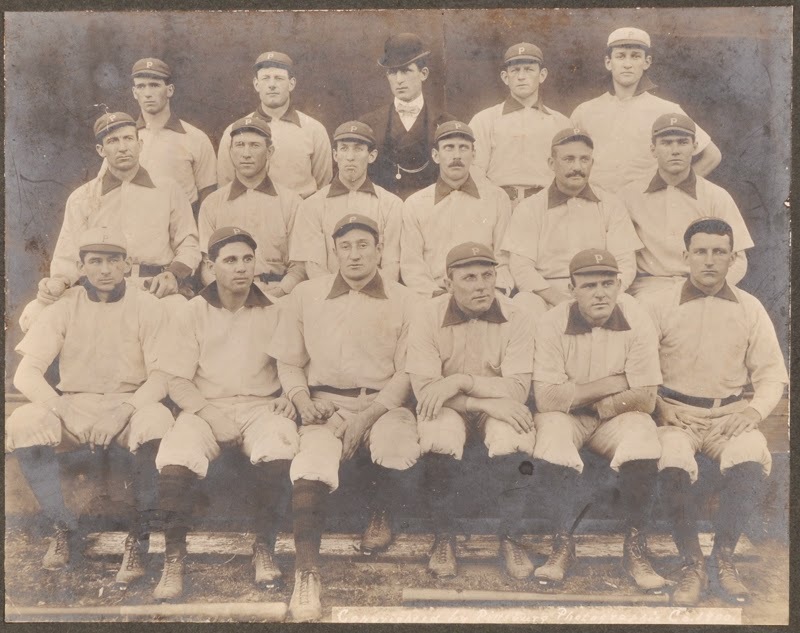 I recently covered a 1910 "Most Tied Game Ever" between Pittsburgh and Brooklyn, itself a statistical oddity that wouldn't happen in today's no-tie leagues. 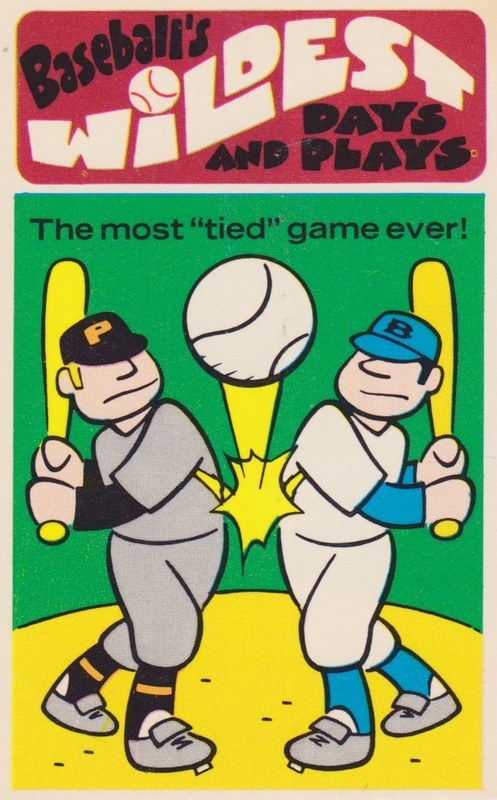 But that profile omitted their more significant matchup one decade earlier, as Brooklyn traveled to Pittsburgh for one of the post-season "championships" that presaged our modern World Series. Credit goes to a Retrosheet discussion for finding the original 1900 Pittsburg Press coverage of that series, as Brooklyn won the best-of-5 and its "Punch Bowl" prize. 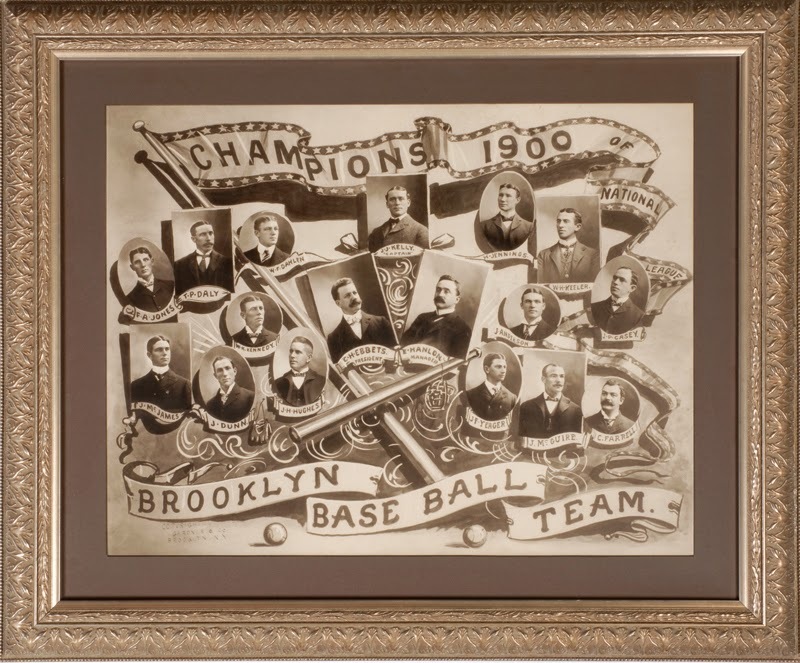 You can find plenty more on pre-World Series champions at Wikipedia, as records stretch all the way back to the 1857 Brooklyn Atlantics, organized baseball's first title winner, who went 7-1-1 in a season just nine games long. Eureka, it's a stamp! This 200-count set of MLB players stands out for two reasons. 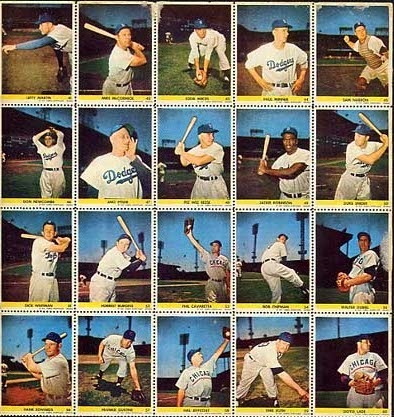 Most prominent are the full-color, Kodachrome photos, which bubblegum cards didn't premiere until 1953. Second, and less visible, the backs use lick-and-stick glue, a substance rationed during WWII, but back in public circulation by 1949. Vintage catalogs record these as "Eureka Sportstamps" because of the tiny print under that yellow bar. "Eureka" doesn't appear on the album or packaging, so it's possible the stamps were printed under a separate company name for financial reasons. Thanks to its photo album and some deep investigation by a stamp collector (see Cinderellas and Poster Stamps of F. H. Dietz), we know an entity called National Poster Stamp Society designed the set itself, arranged on 10 sheets of 20 players each. 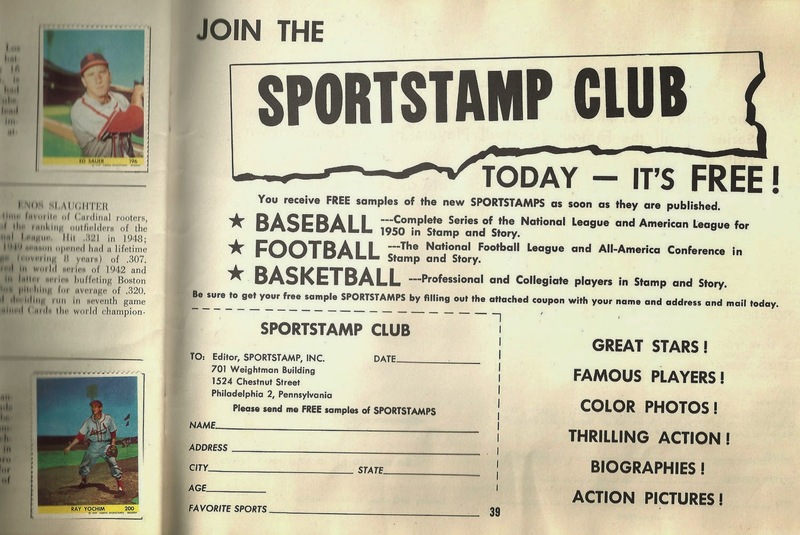 National Poster Stamp Society planned to release further Sportstamps sets, but stopped at this single run of 200 National Leaguers. Scans of the company-made album cover, pages, and "collectors' club" hint at what could've been. Join today -- it's free! UPDATE: Return address on one of the original mailing envelopes. Sportstamp kept their offices in the Weightman Building on 1524 Chestnut Street, Philadelphia, PA. The album itself echoes the Sportstamps text and claims a home in Scranton, PA. 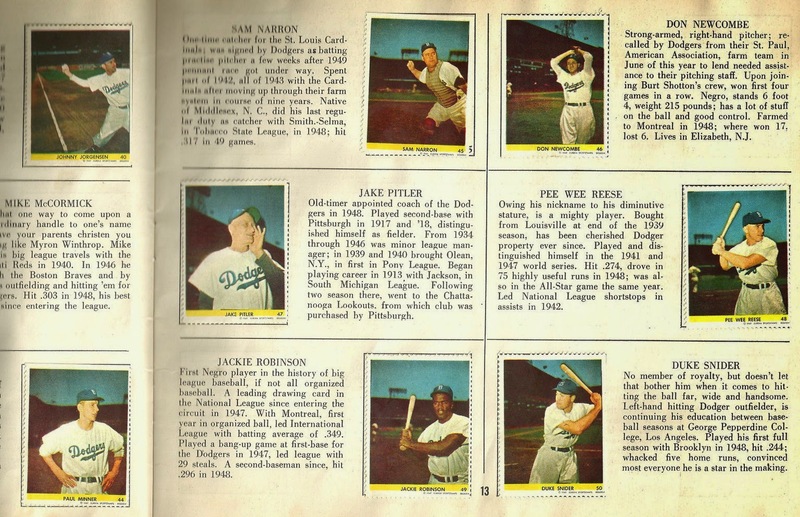 Even with just the National League represented, this set's checklist features big HOFers like Jackie Robinson, Snider, Campanella, Spahn, and Musial. The first two stamps picture MLB executives Happy Chandler and Ford Frick, and then teams appear alphabetically. The Boston Braves come first, so right-hander Red Barrett gets the #5 between Johnny Antonelli and Clint Conaster. 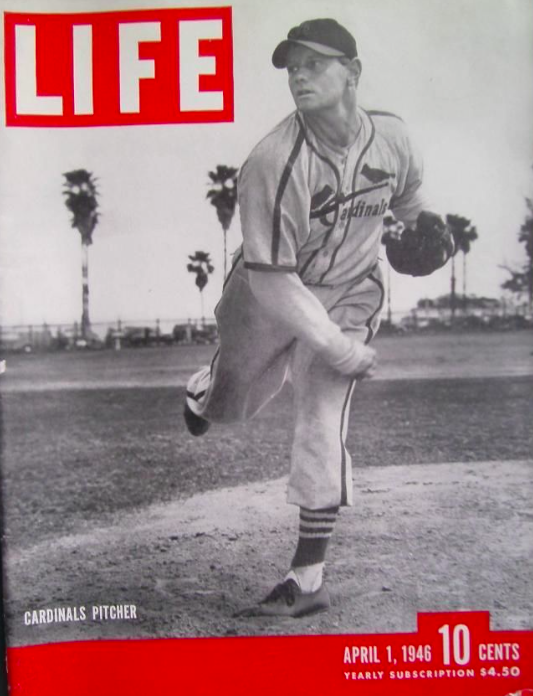 A good wartime baseball performer, Red Barrett won 23 games in 1945 (career stats) and scored this April 1, 1946 cover of Life Magazine. 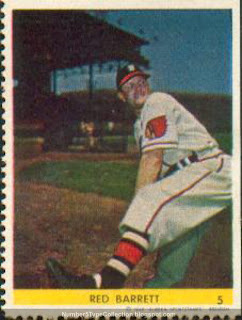 Barrett also set a baseball record for efficiency by completing a 2-0 win over Boston's Braves in just 58 pitches on August 10, 1944; Baseball-Reference covered both it and other quick games. UPDATE: Terrific find by fellow OBC collector Greg, who pointed me to this October 1949 Poster Stamp Bulletin profile of the Eureka set. Its article states a 600,000 print run and August release date, with the whole set (plus album) costing just $1. 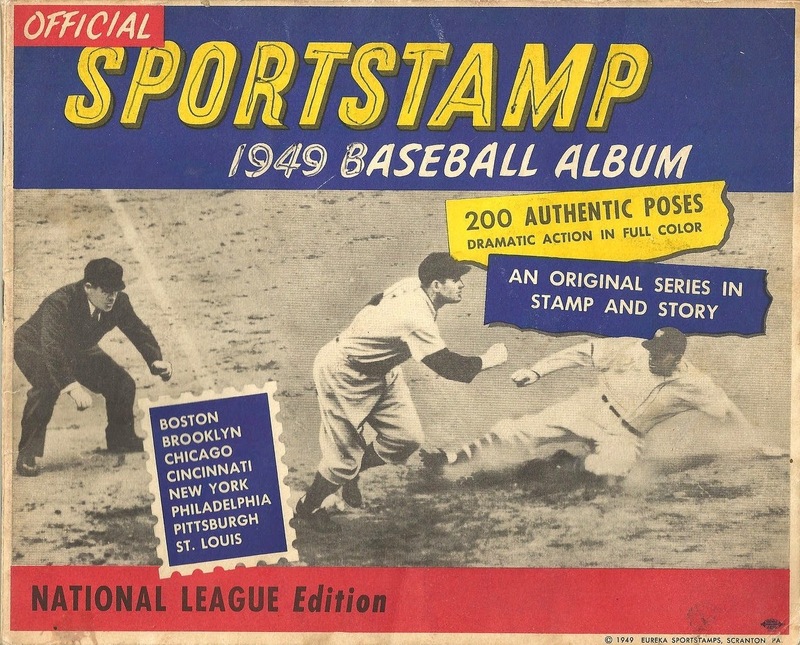 According to Alphabetilately.org, the National Poster Stamp Society was a hobbyist arm of the Mid-States Gummed Paper Company, making their 1949 printing one of the earliest direct-to-collector baseball sets. 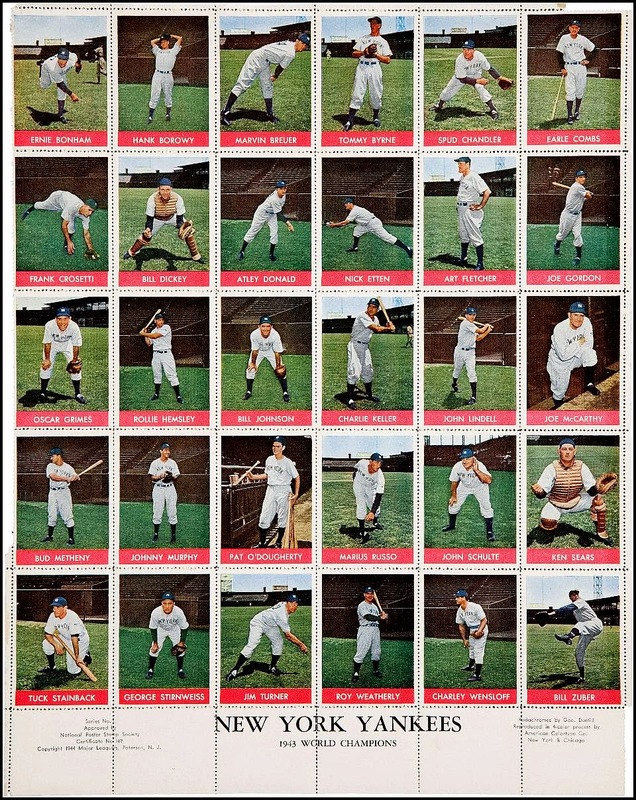 It's only preceded by another NPSS set, this 24-player 1944 sheet of New York Yankees that celebrates their 1943 World Championship. NPSS credits longtime baseball photographer George Dorrill with taking these images and, as in 1949, they created an album to hold the stamps. Its design echoed the American air power theme familiar throughout WWII. October 1944's issue of the Poster Stamp Bulletin priced the full set (with album) at thirty-five cents. Full credit to Alphabetilately.org for tracking down all this extra info and providing scans! Value: Single stamps are scarce but easily damaged, so come cheap in low-grade. Stars in good shape can run $20 and up, and albums with full sets cost hundreds. Fakes / reprints: Haven't seen any in the marketplace, but it's worth being careful when buying stars, since sets with blank backs take half the energy to fake. 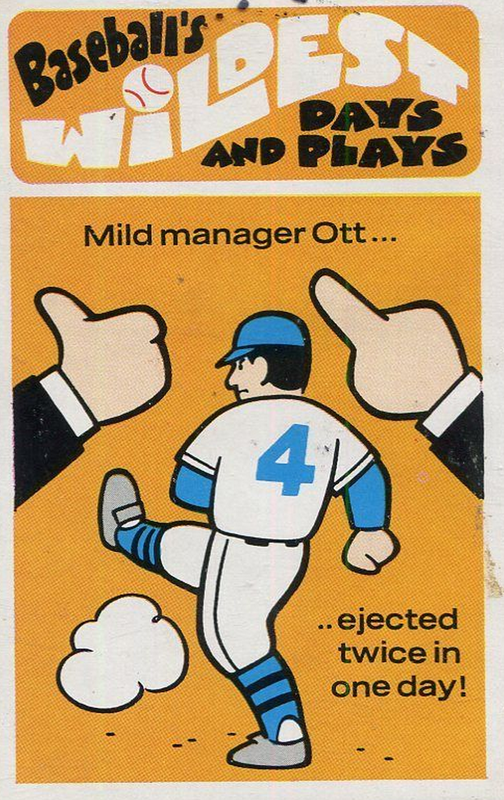 This post's a chance to return to one of my favorite baseball card eras, the growth of 1970s oddball publishing. In collecting terms, "oddball" typically refers to sets with short print runs or unusual subjects, often sold directly to collectors instead of wax-wrapped for stores. 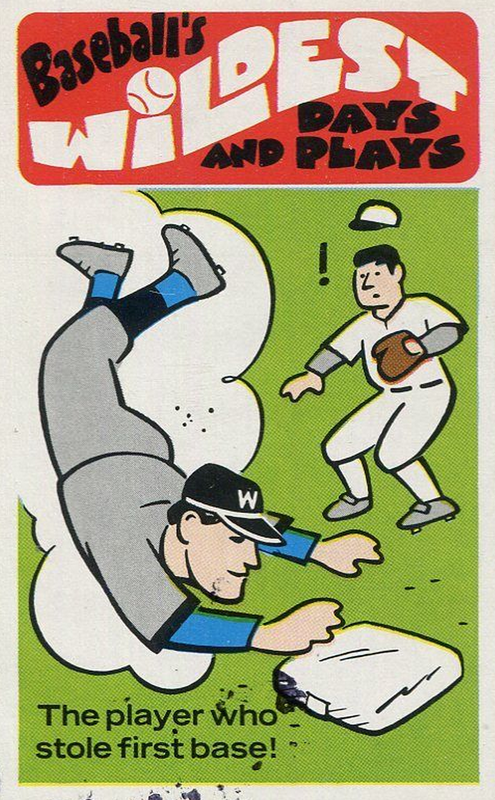 Baseball artist Bob Laughlin created many such sets over the decades, doing both self-published work and sets like this one for Fleer, itself a company that spent many years jousting with Topps over the right to make "real" (non-oddball) player cards. 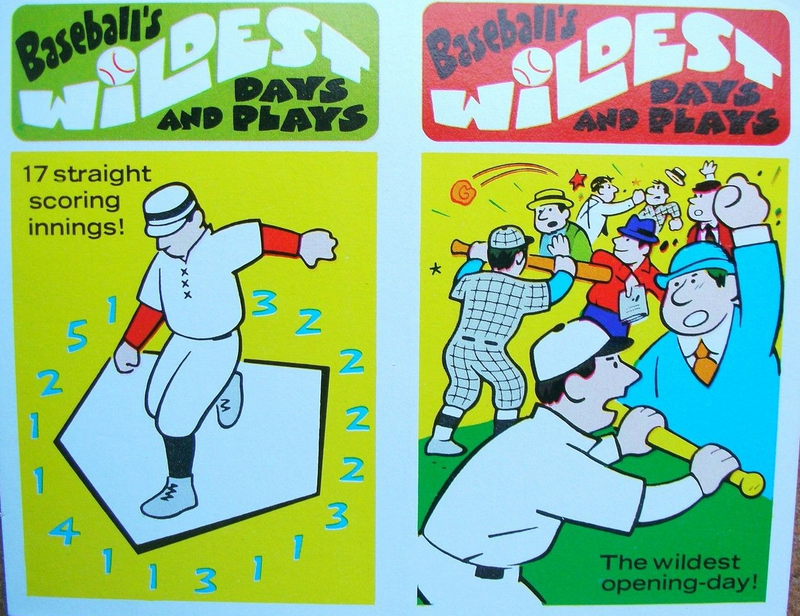 Each card from Fleer's Wildest Days and Plays is like an unusual fact you'd find sprinkled into a sports almanac, but on cardboard. 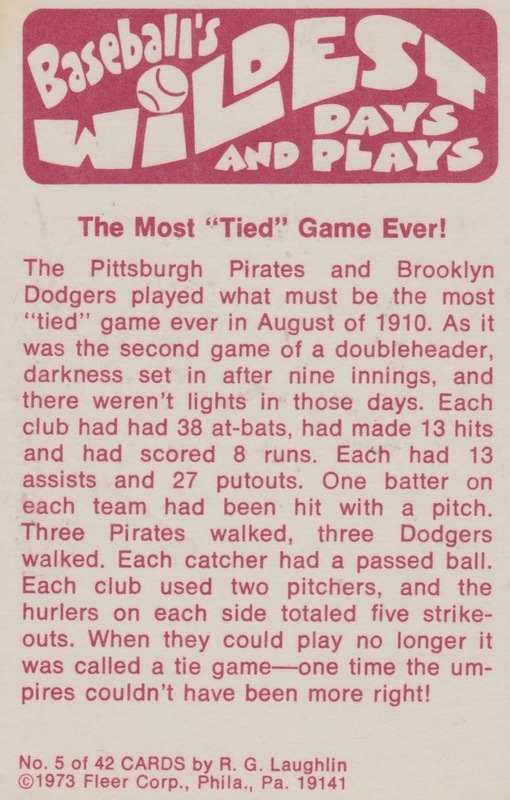 The set's #5 highlights a statistical oddity from Saturday, August 13, 1910, the second game of a Pittsburgh-Brooklyn doubleheader. Thanks to Google news archives, you can read original coverage of this doubleheader game from the Pittsburg Press. 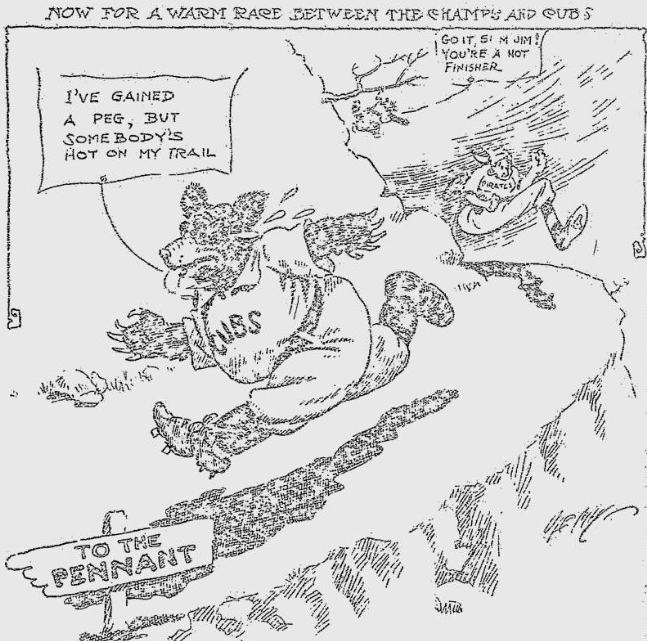 While searching Pittsburg Press archives for game info, I also came across this comic of the Pirates on a late-season chase after Chicago for the NL crown. Unfortunately for the hometown faithful, Chicago went on to win the pennant easily and Pittsburgh finished a distant third, 17.5 games back. 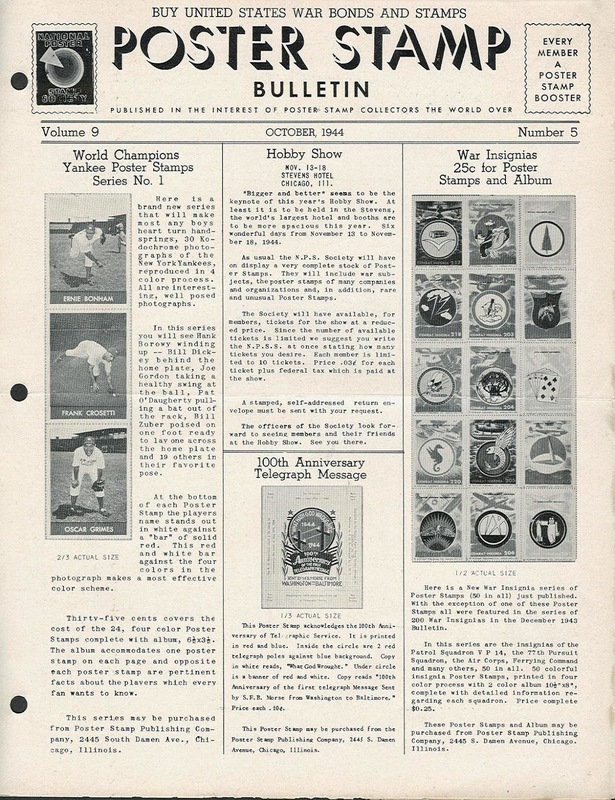 If you ever need to find old baseball coverage, Google's news archive provides a wide range of cities and papers back to the early 1900s and is especially handy for those willing to page through scanned original newspapers, microfiche-style. If you've got an hour or two to kill, that's an easy way to do it. According to eBay dealer Columbia City Collectibles, Fleer also issued this (scarcer) two-card version in wax packs. These larger panels purportedly came with Fleer's team logo patches and gum, so might've be a special version issued to help clear out back stock. Their eBay listing's the first time I've seen one. 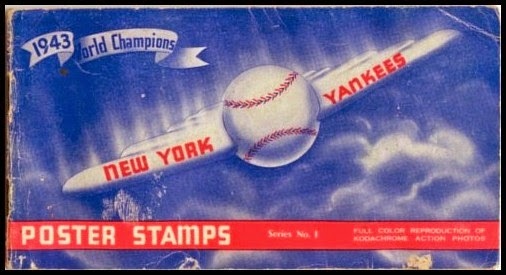 Value: Not many cards in this set represent "stars," so most (like this #5) cost a few dollars. The cards that refer to Babe Ruth run somewhat more. Fakes / reprints: Haven't seen any in the marketplace and they'd be a tough set to profit by faking.